This picture obviously show an AIM type filled in (although my Screen Name is misspelt). It also shows that you can add other information as you deem relevant. 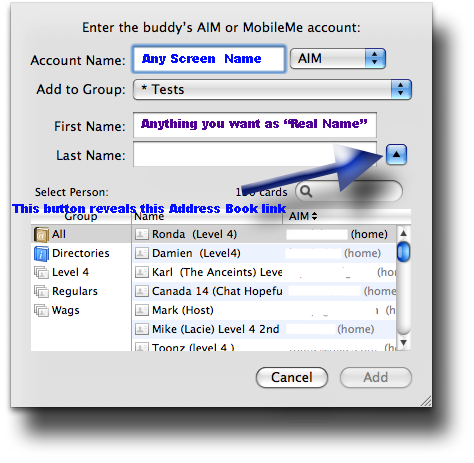 What you type here will be displayed in the Buddy list AND feature as their Name in the Address Book where it will be also added. You can get a problem if you try to add a Buddy this way and you have matching Information already in the Address Book. For Instance lets say I was adding just my Real Name of Ralph Johns to the First Name and Last Name text fields. Obviously that is the name of my Mac User accounts and the Me Card in the Address Book. iChat would recognise this and report "Feedbag Error 10" ( See the Error Page ) and not add the Buddy to iChat or the Address Book. This is the same if you have a Buddy as a contact in the Address Book whether it is full details or just an Email Address. Adding their Screen Name to the Address Book info or using the Select Buddy option at the earlier window will sort this. NOTES: iChat 4 does not report Feedbag Error 10 on screen like the earlier versions of iChat and just will not add the Buddy. Unfortunately it also matches a poor login situation normally cause by AIM updating their Screen Name Lists and it just seems like you can not Add a Buddy in general. It is a process of elimination which it is for you. 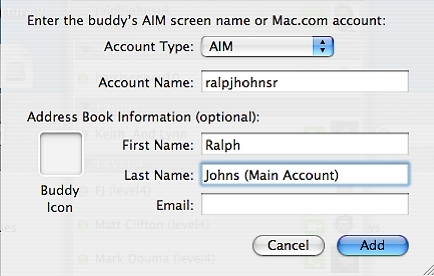 One other fact is that adding an Apple Screen Name of either @mac or @me.com will cause iChat and the Address Book to add that contact to the Address Book with just the Name as an email and not just a Screen Name (it adds to both pints in the Address Card). This may cause confusion in Mail if the person is using a Trial Account (Or a lapsed paid for account) that has expired as it is then no longer a valid email address.